Derek Abbott* reviews Serbia in the Great War 1914-1918, by Mira Radojevic and Ljubodrag Dimic, and Fighting on All Fronts: Popular Resistance in the Second World War, edited by Donny Gluckstein. These books deal with quite different subjects but they share a common ambition, declared in their respective introductions – to redress the inadequacies of existing histories. Two contemporary Serbian historians have the avowed intention of confronting ‘historical revisionism’ as it applies to the history of Serbia between the Congress of Berlin in 1878 and the foundation of Yugoslavia in 1919. 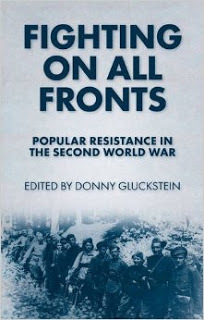 Gluckstein, somewhat heroically, claims his collection of essays addresses the ‘problem’ that, in the history of the World War II, ‘On the whole only surface phenomena – the military campaigns, the biographies of individual leaders and suchlike – have received attention’. ‘Revisionism’ as regards the history of Serbia appears to refer to any interpretation (for example by Christopher Clark in his recent The Sleepwalkers) that portrays Serbia as anything other than the ‘brave little Belgium’ of the Balkans, quietly going about the business of nation building, occasionally let down by its own leaders, beset by greedy and duplicitous neighbours who torment their Serb minorities and wish to eliminate Serbia itself. The reader will find little acknowledgement of the complexities of political, ethnic and religious loyalties with which modern histories of the region normally wrestle. The legitimacy of aspirations to a Greater Serbia, drawing on semi-mythical memories of the short-lived ‘Empire’ of Stephan Dusan in the 14th century or Serbia as the Piedmont of South Slav unification, are accepted uncritically. That a Greater Serbia, a Serb-led Kingdom of the South Slavs or the extremism of Serbia’s internal politics, particularly the conspiratorial activities of semi-official secret societies with a penchant for violence, might have caused justified anxiety and hostility among Serbia’s neighbours, seems to escape the authors. Treated with caution, the work does, nevertheless, provide a useful study of Serbian politics and foreign relations, most particularly Serbia’s dealings with the Allies in the later years of the War, leading to the establishment of Yugoslavia. The Balkan Front, while not decisive in World War I, was significant and Serbian military campaigns and the suffering of the Serbian people under occupation deserve to be better known. Despite early Serbian defeats, successful counter-attacks drove the Hapsburg forces out of Serbia by the end of 1914. As in World War II, Germany was forced to divert troops to bolster an ally in the Balkans. In 1915 the Central Powers conquered Serbia and forced its army and government into exile. The 1915-16 winter retreat of the remnants of the army and many thousands of civilians over the mountains of Albania and Montenegro to the Adriatic coast is both heroic and, with tens of thousands of casualties, tragic. The Serbs, evacuated by the Allies, joined the ‘Gardeners of Salonica’ facing Bulgaria until a final flourish took them back to their devastated homeland. In mid-September 1918 Allied forces commanded by General Franchet d’Esperey – ‘desperate Frankie’ to British troops – broke the Bulgarian defences and advanced rapidly; Bulgaria signed a truce by the end of the month; Serbian troops liberated Nis in mid-October and Belgrade on 1 November, having covered 700 kilometres in seven weeks. That campaign played a significant role in convincing the Germans that their game was up. Bulgaria’s collapse precipitated Ludendorff’s: he appears to have suffered a nervous breakdown and at a Crown Council on 29 September demanded that Germany seek an armistice. The book is thoroughly researched and copiously referenced but, in addition to being somewhat one-eyed, it is let down by a ponderous translation and sloppy editing; for example, Field Marshall von Mackensen appears throughout as a renegade Scot, von McKenzie. The book would also benefit from a couple of maps; some place names are regrettably familiar from more recent Balkan wars but many are not. Fighting on All Fronts offers a neo-Marxist interpretation of World War II, ‘a struggle between rival imperialisms to dominate the globe’, from which emerged a people’s war, ‘resistance movements, anti-colonial struggles and a host of popular activities which the masses injected into the war process to express their aspiration for an end to oppression and exploitation’. The dismissal of historical writing on the war as dealing mainly with ‘surface phenomena’ is a straw man. The production of self-serving histories in the decades after the war, histories that sought to vindicate the victors and to promote heroic national myths of resistance on which post-war states could be rebuilt, had largely run its course by the late 1960s. More recent research and writing has recognised that the history of the period is full of contradictions and ambiguities. The moral high ground claimed by the Allies in 1945 has been eroded (but far from completely undermined) from many directions. The attempts to restore western colonialism in Asia, the use of indiscriminate area bombing and, finally, nuclear weapons, the lenient treatment of all but a relatively few leaders of Axis countries, the suppression of popular movements on the left in the interests of ‘stability’, the cynical but pragmatic carve up of Europe between the USSR and the West are all the subject of extensive scrutiny. The complexity of each country’s response to occupation, the decision between collaboration, passivity and resistance, and the impact of occupation on all parts of society have also been the focus of historical study for many decades. The book has eleven chapters. The editor contributes an introduction and chapters on Russia and China. Then there is Frank Renken on Algeria, Kieran Allen on Ireland, Janey Stone on Jewish resistance in Eastern Europe, Mark Kilian on the Netherlands, Tomas Tengely-Evans on the Slovak uprising of 1944, Tom O’Lincoln on Australia, William Crane on Burma, Kaye Broadbent on Japan and Ben Hillier on the Philippines. Many of the essays are worth reading, even if Gluckstein’s claim to be getting beneath the surface is overblown and the dismissal of the Allies and the Axis as no more than competing ‘imperialisms’ is superficial and lazy. The dichotomy of the ruling classes (including Stalin’s Russia) fighting an imperialist war to promote and protect their own interests while ‘the masses’ fought an altruistic war to end oppression and create just post-war societies is undermined by the essays in the book itself. As they make clear, across Europe and Asia ‘the masses’ wilfully refused to act uniformly: some resisted, some collaborated, many were influenced by anti-Semitism and many despised it, others looked opportunistically to self-preservation and many fought selflessly for their imperial masters. Ordinary people certainly believed that the sacrifices of wartime would only be vindicated if the post-war world offered a new beginning – the Beveridge Report and the Attlee Government in Britain, the rise of social democracy throughout Europe and independence movements in Europe’s colonies provide ample evidence of that – but whether those aspirations added up to a ‘people’s war’ in anything other than the most general sense is arguable. The essays dealing with Algeria, Burma, the Philippines and to an extent Australia remind us that subject peoples in Asia and Africa had no reason to love their European masters and that taking advantage of the defeats in Europe to further the pursuit of independence was sensible policy that does not fit into European narratives of heroic resistance versus collaboration. Equally, the racist attitudes of settler populations and of ordinary citizens in the Imperial powers, despite honourable exceptions such as Australian trade union support for Indonesian independence, suggest that trying to fit local movements into a coherent global view is a difficult project. * Derek Abbott is a retired Senate officer with a history degree from Aberdeen University and a long-standing interest in military history.